This photo of the garden last summer reminds me that I really need to fix the window on the summerhouse – the door fell off in a storm and broke the glass, I’ve got two sheets of perspex sitting in the conservatory waiting to be fitted! The window fittings at Blackwell House near Windermere were all individual, lots of beautiful designs typical of the Arts and Crafts movement. I visited last year with my Embroiderers Guild and enjoyed a fascinating guided tour. 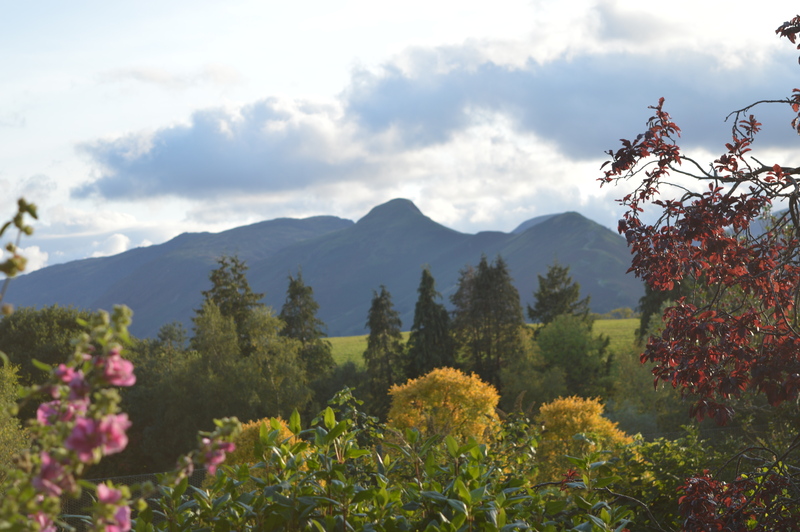 This was the view from the dining room window of our hotel in Keswick when we did our four lakes walk a couple of years ago. It is, of course, my favourite fell, Catbells! 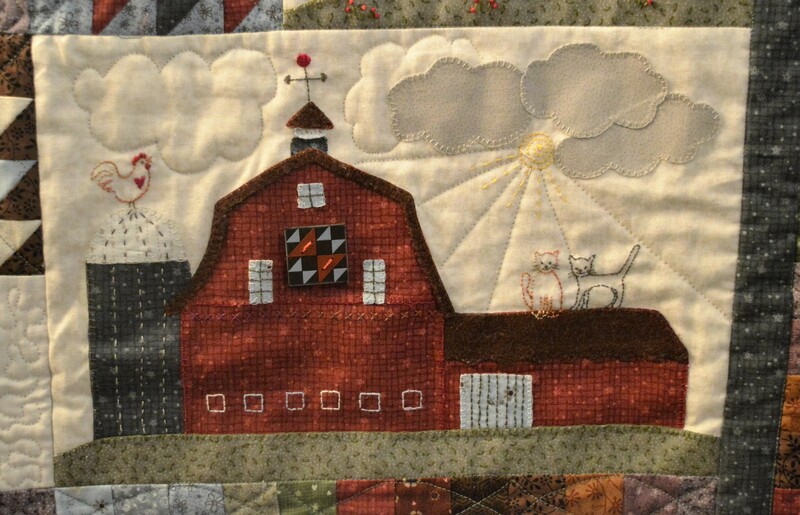 The windows on this old red barn are appliqued and embroidered. It is one of the blocks of the Anderson Farm quilt, I hadn’t mastered needle-turn applique at that point so I think they are bondawebbed on and stitched down. Why not follow the link to Wild Daffodil and see else is sharing lots of window photos. This entry was posted in Photo Challenge and tagged windows. Bookmark the permalink. Love your collection of windows! Another fabulous collection of windows. Hardly anything beats looking out onto your garden. The Catbells is a runner up. All nice photos. I really like the wrought iron fittings on those windows! And the out-sized cats on the roof of the barn! Enjoyed the post and took a hop over to Wild Daffodil too – amazing crochet on her page!